Perhaps I stand corrected. 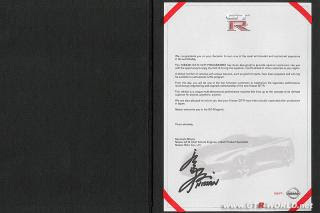 This appears to be a genuine letter, signed by Mizuno, on some limited release Nissan GT-R's. Nissan's Middle East website says the Nissan GT-R will not be released until early 2009. We congratulate you on your decision to own one of the most anticipated and acclaimed supercars in the world today.The NISSAN GT-R VVIP PROGRAMME has been designed to provide special customers like you with the opportunity to enjoy the thrill of driving this supercar, months ahead of other customers in your region. A limited number of vehicles with unique features, such as gold trim parts, have been prepared and will only be available to participants in this program. A limited number of vehicles with unique features, such as gold trim parts, have been prepared and will only be available to participants in this program. From this day, you will be one of the few fortunate customers to experience the legendary performance, revolutionary engineering and inspired craftsmanship of the new Nissan GT-R. From this day, you will be one of the few fortunate customers to experience the legendary performance, revolutionary engineering and inspired craftsmanship of the new Nissan GT-R. This vehicle is a unique multi-dimensional performance machine that lives up to the concept of an ultimate supercar for anyone, anywhere, anytime. This vehicle is a unique multi-dimensional performance machine that lives up to the concept of an ultimate supercar for anyone, anywhere, anytime. We are also pleased to inform you that your Nissan GT-R was meticulously inspected after production in Japan. We are also pleased to inform you that your Nissan GT-R was meticulously inspected after production in Japan. Nissan welcomes you to the GT-R legend. Nissan welcomes you to the GT-R legend. Nissan Motor Co., Ltd. Nissan Motor Co., Ltd.
Mostly translated text after the jump "Recently, arrived in Abu Dhabi to introduce GT-R, but this car's identity was reported in the overseas sites. 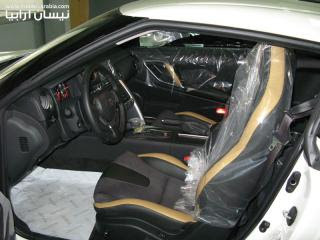 日産自動車がGT-Rを中東で発売するのは2009年3月。 Nissan GT-R is the Middle East is now on sale March 2009. 海外のサイトなどでは「中東でのテスト車両」などと書かれていたが、どうやらVVIP専用の特別仕様車らしい。 Foreign sites such as the "test vehicle in the Middle East" and written in, but apparently only VVIP車らしいspecials. VVIPとはVery Very Important Personの略。 VVIP is an abbreviation for Very Very Important Person. アラブの王様？ Arab kings? に納車されるGT-Rは正規発売の半年以上前ということのようだ。納車the GT-R will be released six months or more before the regular them. となれば、ゴールドの内装トリムも理解できる。 It would be a gold interior trim and understandable. この水野和敏CVE&CPSの直筆サイン入りの書面には以下のように書かれている。 The Mizuno Toshi Kazu CVE & CPS signed the autograph is written as follows in the product."